The first title to this post was to be a wordless Wednesday. After finding the pictures I wanted to post, there was NO way I could let it be wordless. There is too much to say. My granddad was a veteran. He served in World War II and was wounded in Warsaw, Poland. He was to be sent home, but wouldn't go and requested to be sent back out. I thank God every day that he was spared to be sent home at the end of the War. He then wed my grandmother and began a 50+ year love story. He always said, "I don't know what she ever saw in me. I'm glad she waited for me." 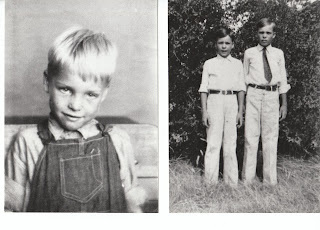 Papa is on the right in the second picture. I see Collin Mac when I look into the face portrayed in this picture. I don't know if this was before or after the war, but he hardly ever spoke of it. Memaw said early on he would wake up from some awful nightmares, but he never told her what it was about. God only knows what he saw there now. He took it all to his grave. These two pictures were taken about 10 days before he passed away. I was lucky enough to be there when these were taken and my wonderful Aunt Dana had the forethought to take them and I am so glad she did. This was the last time I ever saw him alive. I am often floored at how much I miss him. I can still think about him and smell his skin. I can't tell you how many times in my life I saw my grandpa this way. 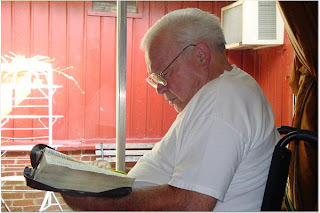 He always had a bible opened on the dining room table to whatever passage he was reading at the moment. That man knew his bible. And he LIVED it. Thank God for veterans and Thank God for my granddad. 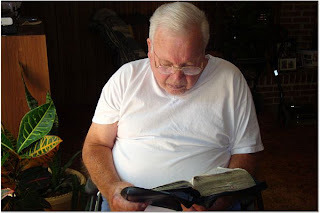 He began an amazing Christian legacy for our family.